I have been very happy to have comments by the art historian Marianne Gilchrist - aka "Silverwhistle" - on several of my posts. In September she published an article on the website ARBR (Amis de Robespierre pour le Bicentenaire de la Révolution) which pulls together some of her thoughts on that all-important question: what did Robespierre look like? The physionotrace was a mechanical device which made it possible to trace a rapid profile from life. This could then be worked up into a full-size portrait, or used to create a small copper plate for engravings. There is no reason at all to doubt that Robespierre really did sit for a physionotrace: the atelier of Fouquet and Chrétien in the Cloître Saint-Honoré was just round the corner from his lodging with the Duplays. 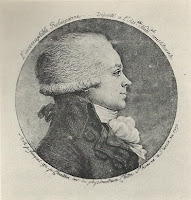 The text on the engraving reads "The Incorruptible Robespierre - Deputy of the National Constituent Assembly" and "Drawing by Fouquet, engraved by Chrétien, inventor of the physionotrace, Cloître Saint-Honoré Paris in 1792"
A drawing in the Château de Versailles (Inv.Dess.857) can tentatively be identified as the original grand trait from which the engraving was made; according to Marianne, the dimensions of this portrait (44 x39cm) are typical for the workshop - the picture has been trimmed, possibly removing Fouquet's signature in the process. (A similar grand trait in the Musée Carnavalet is signed behind the head). In both pictures the profile of the nose is unmistakeable. Marianne finishes with some comments on the so-called "death-mask" of Robespierre, with reference to an article by Hervé Leuwers et Guillaume Mazeau, published in 2014, following the appearance of the Froesch/Charlier facial reconstruction. According to this, the Tussaud death mask is "certainly false". There is a certain resemblance to the authenticated portraits of Robespierre when viewed from the front, but the profile is wrong. The nose of the mask is too short and straight and lacks the pointed end. The pock marks on the mask are also much heavier than those in evidence on the physionotrace portrait and are wrongly distributed. 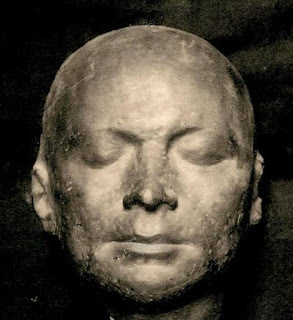 Hervé Leuwers and Guillaume Mazeau add a little bit more information regarding the provenance of the Robespierre death-mask. They make it clear that all the existing and documented copies of the mark definitely derive from the same original. The various casts, in Aix-en-Provence, the Musée de l'homme, Paris and the Hutton Collection in Princeton, are all identical. The firm of Lorenzi, founded in 1871, still offers copies commercially - one was used for the Derniers portraits exhibition at the musée d’Orsay in 2002. These casts too are of identical dimensions. Hector Fleischmann in 1911 listed a plaster cast belonging to Dominique-Vivant Denon, plus three other examples which were said to derive from a mould belonging to François-Louis-Hébert Turbri. From Fleischmann's photographs, it would appear that these masks too are the same. The cast in the collection of Gabriel Thomas is almost certainly the bronze owned today by the musée Grévin. The most natural assumption is that Turbri purchased Denon's plaster cast in 1826 when it was sold on his death, perhaps together with the mould - or maybe he had a mould created from it. The connection is strengthened by two pieces of evidence which suggest the Denon mask was the same as all the others. Firstly, the dimensions given in the inventory of the Denon sale are identical with those advertised for the Lorenzi copies (and thus all extant examples). Secondly, Hervé Leuwers and Guillaume Mazeau refer to a lithograph, possibly by Denon, which shows two sketches of the mask - and presumably give a clue as to what it looked like. I can't find this on the internet. (The references given are to two exhibition catalogues, one for 1999 and the other for the Derniers portraits exhibition in 2002.). Maybe this drawing by Denon from the Metropolitan Museum, labelled no.2, corresponds to one of the two views - certainly it recalls the (fat-nosed) casts. In Fleischmann's account, there is no tradition concerning the Tussaud Robespierre, although the plaster cast in Aix-en-Provence used by Froesch and Charlier was one of several copies of the London mask ordered by Alexandre Dumontier, who founded the Society of Phrenology of Paris in the 1830s. The copy in the Musée de l'homme is presumably another. Buffenoir in 1909 credited the Tussaud mask with primacy, but this is not at all established. All we really know for certain, is that the Curtius/Tussaud waxworks featured the heads of several guillotined Revolutionaries from the late 1790s onwards, and that Vivant Denon owned a plaster cast of a lifemask in his collection by at least 1817, when Lady Morgan remarked on it. I am not even clear what exact Tussauds possesses - I assume it is a cast, from which the mould for the various wax models is derived? There is not a great deal new to be added. Personally, I still think even the Tussaud waxwork has a disturbing presence, and I would like to see some good side-on views before I rejected it out of hand. This cannot be just a forgery, it is the face of a real person. If not Robespierre, then who is it? The relationship between the mask and the execution drawing (for a history painting?) raises another question to me. It is possible that the mask was created from a live model for someone working on a history painting. If so, the artist would have followed the usual practice of seeking out a model who would be acceptable to viewers as resembling the historical subject. My doctoral research, many years ago, was on 19C history painting, and I know from letters and memoirs of several artists that they often tried to find live models who resembled the available portraits of their historical subjects. Further: The Denon drawing, which certainly resembles the mask, is not identified as Robespierre (whom it does not resemble). Is it possible the subject may be intended to be another character? The headsman holding the head, and the ragged line of the neck may even suggest a pre-mechanised beheading, perhaps an earlier historical subject. Do you know the lithograph referred to in the Leuwers/Mazeau article? I couldn't find it. I have now received a better photograph of the mask in profile: the nose and forehead do not match the physionotrace when overlaid in PhotoShop, though there is some similarity in the mouth and chin. Robespierre's nose is longer and sharper. Also, the shape where it meets his forehead is different. From the front, the mask face looks shorter and broader. It's a very good mask, and an interesting face, but whoever he is, he's not Max. I'd like to know who he is – just as I would with the pastel-coloured physionotrace. 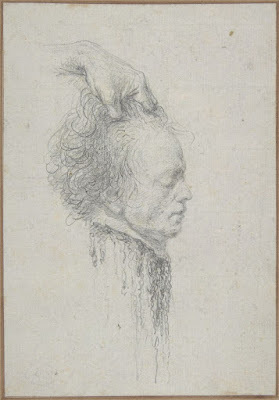 The catalogue from the Musée d'Orsay is only on Snippet view on Google, so no luck there, and it's rather expensive… The Denon drawing (in the Met) is described only as "a severed head said to be" Max. I'm not convinced the Denon "Young Man" with the fake David signature is him, either – too chubby, and the nose is wrong again, unless it's just a bad drawing. There's a distinctive pertness about Max. I'm reminded of the claims made for a "death mask" of Mary, Queen of Scots, which bears scant resemblance to her portraits (it's too fine-featured and pretty to be her! ), and is probably really a lady from the Duke of Hamilton's family (from whom the mask comes).